Last year DDT and Melania had a gathering but made a brief appearance and didn’t pose for photographs. 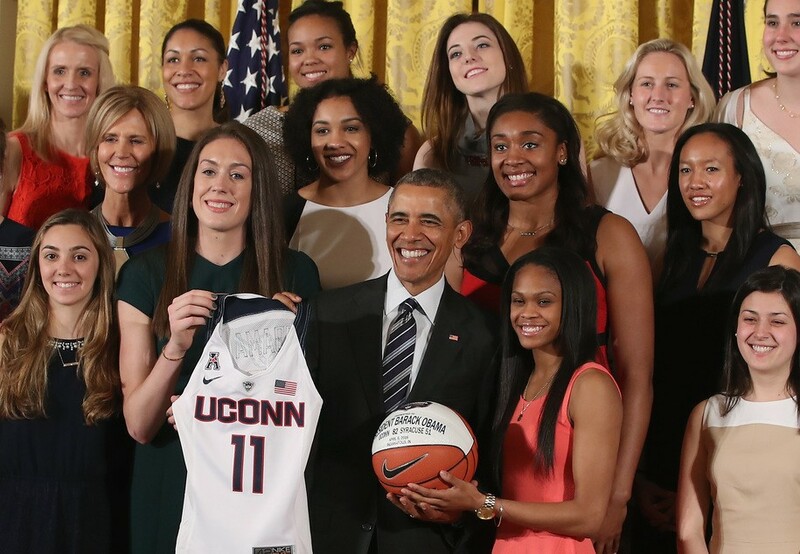 The guest list also avoided the inclusion of many black and LGBTQ reporters. Even Bill Clinton was willing to have his picture taken with journalists days after he was impeached. DDT’s relationship with the media has become increasingly frayed during the past year, especially after he pulled Jim Acosta’s press credentials and told the world that his business with Saudi Arabia was more important the torture and dismemberment of Jamal Khashoggi, a U.S. journalist for the Washington Post. 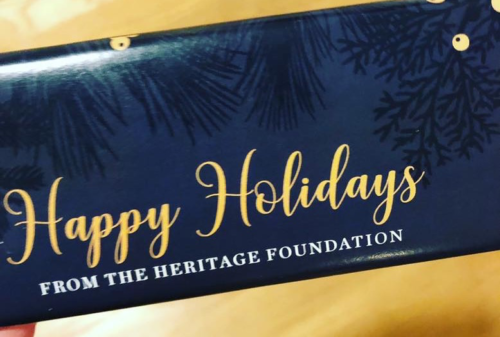 In their passion about the “war on Christmas,” conservatives forgot to notify the importance of rejecting “Happy Holidays” to its own religious right group Heritage Foundation. 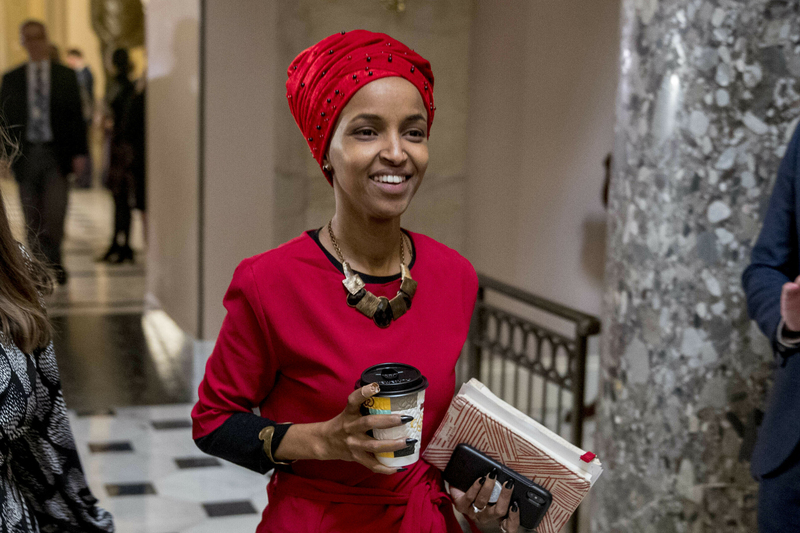 Although that political organization has typically used the winter holidays as a wedge against inclusiveness, this year’s gifts fail to represent their battle. 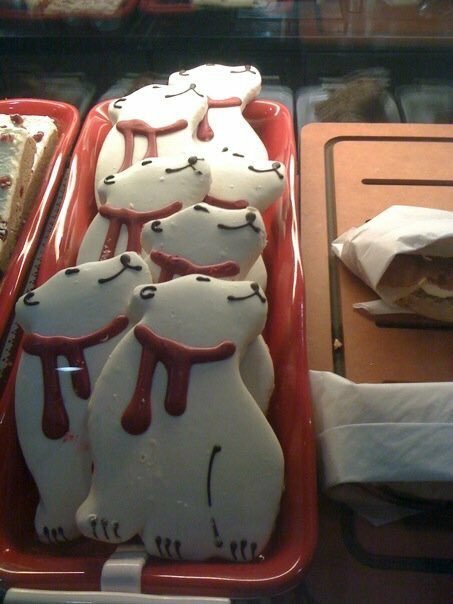 Conservatives—who don’t care about climate change killing polar bears—are up in arms against Starbucks for their sugar cookies decorated as polar bears. The major problem with their complaint is that the cookies disappeared eight years ago. In Elkhorn (NE), Manchester Elementary principal Jennifer Sinclair banned a long list of Christmas traditions, including candy canes. She wrote, “Historically, the shape [of the candy cane] is a ‘J’ for Jesus. The red is for the blood of Christ, and the white is a symbol of his resurrection. 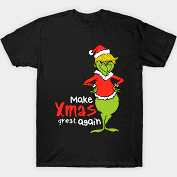 This would also include different colored candy canes.” Her order has been reversed, and the principal is on administrative leave. Because of a high level of “concerns,” a police officer has been posted at the school. Gassing asylum seekers trying to legally come into the United States from Mexico. Separating children from parents, especially with no intent to return them, and imprisoning them. Killing civilians, including those in schools and hospitals, throughout the Middle East. Refusing health care for low-income people after denying them a living wage. Destroying the planet through ignoring renewable energy sources. Depleting the world’s resources to make the wealthiest people wealthier. Building white supremacy over minorities. Insisting on war to build corporate profits. Making dangerous decisions about the economy. Putting unqualified conservative bigots on federal courts. Removing women’s and voting rights. Rigging elections and winning them by fraud to achieve the above. The Vatican is also having a problem this Christmas season. Pope Francis has removed two cardinals from the Council, his international advice body, for alleged sexual abuse. 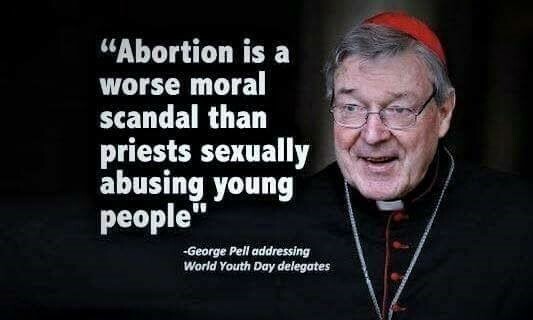 Cardinal Pell, still the Vatican treasurer, will be on trial on sexual abuse charges in Australia, and Chile’s Francisco Javier Errazuriz has been accused of covering up child abuse while Archbishop of Santiago. Cardinal Laurent Monsengwo Pasinya, 79, also resigned from the Council leaving only six in the group. There are no plans to immediately the empty seats. DDT’s firm Christian evangelical beliefs did not extend to reciting the Apostles’ Creed at the funeral of George H.W. Bush. 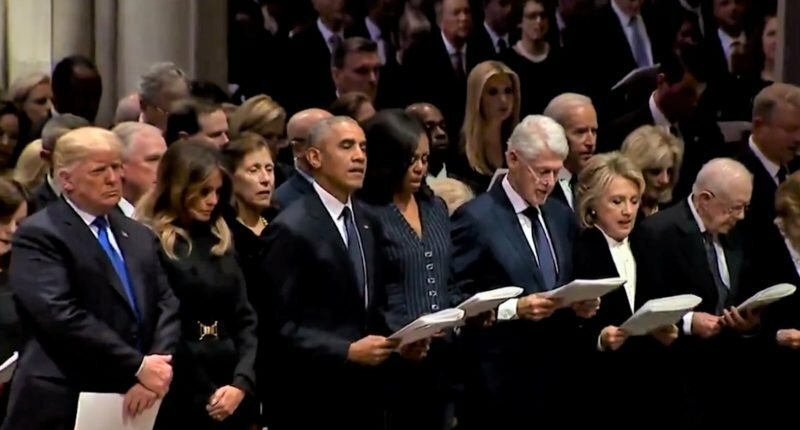 He and Melania stood in stone silence while three former presidents—Barack Obama, Bill Clinton, and Jimmy Carter—participated in the service with their wives. Over a month after the midterm elections, the Democrats still have no intention to “slaughter” tens of thousands of Christians, as Christian broadcaster and conspiracy theorist Rick Wiles warned if the Dems win. He pronounced that “they hate God. These people are against God. Every nation that has been taken over by Marxist-communists, they immediately kill the pastors. They immediately kill Christians. They immediately burn the churches.” He’s also maintained that MSNBC anchor Rachel Maddow, an out lesbian, will lead a coup against DDT. Matt Shea, a Republican state representative in Washington, wants to kill all people he identifies as non-believers. In his “Biblical Basis for War,” he follows “Dominionism,” also advocated by Ted Cruz’s father, that describes God as a “warrior” and demands that his holy war “kill all males” who do not submit to the document’s rules. Spokane County Sheriff Ozzie Knezovich, who gave the material to the FBI, described Shea’s document as “a ‘how to’ manual consistent with the ideology and operating philosophy of the Christian Identity/Aryan Nations movement and the Redoubt movement of the 1990s.” Shea won his sixth term in 2018 with 58 percent of the vote. The ban stating “every member shall remain uncovered during the sessions of the House” began in 1837 to break tradition with members of the British House of Commons who were required to wear hats in order to speak. The House of Commons continued its tradition until 1998; the Senate has no rule regarding head coverings. DDT plans to leave for a two-week vacation at the end of the week. Isolated at Mar-a-Lago in Florida, he will have lots of time for more vicious tweets about the media and his opponents with little monitoring to help him be more rational.